Sam's Town is nestled in the shadow of the Sunrise Mountains, just a few quick miles from the Las Vegas Strip. Sam's Town boasts 645 elegantly appointed rooms and suites. Choose a room overlooking the bubbling brook and trees of the Mystic Falls Indoor Park or opt for a view of the glittering city lights and majestic mountains surrounding the Las Vegas Valley. Enjoy all the excitement of Las Vegas with hospitality and service that's second to none. To make your stay even more enjoyable, we have a sparkling outdoor pool and whirlpool, laundry and valet services and non-smoking floors. 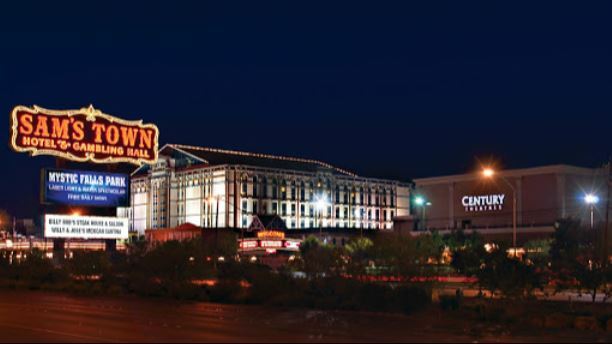 Sam's Town also features a 1,100 seat multi-use event center, an 18-screen movie theatre complex with all THX sound and all stadium seating, bowling center, multiple dining options, a 1,000-space valet parking garage, and a full-service casino with live poker and bingo!